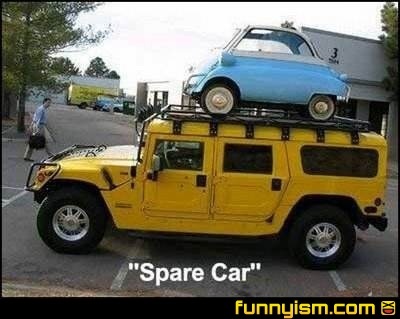 Why would you put the spare car under the car you use? @TitaniumCarrot, my friend and I were talking about this car today. It's so small you can lift it like a wheel barrel and take it in buildings with you. It's on top gear and totally sick! @TitaniumCarrot, is the spare car hidden under the dinosaur? Now they can't get it in the garage. @RMB, Who wants a garage when you have two cars and have no money left? But what about the event of a roll over? Is that little car the car from the Incredibles? The police car from Muppets Most Wanted? . . . Yeah, I saw that movie . . . Don't judge me. It's not a question of why, but how? Anyone got reminded of Luigi and Guido from Cars? Pretty sure that's the Jetsons hover car.